In 1711 Nicholas Hawksmoor was fifty years old yet, although he had already worked with Christopher Wren on St Paul’s Cathedral and for John Vanbrugh on Castle Howard, the buildings that were to make his name were still to come. In that year, an Act of Parliament created the Commission for Building Fifty New Churches to serve the growing population on the fringes of the growing city. Only twelve of these churches were ever built, but Nicholas Hawksmoor designed six of them and – miraculously – they have all survived, displaying his unique architectural talent to subsequent generations and permitting his reputation to rise as time has passed. Living in the parish of Christ Church and within easy reach of the other five Hawksmoor churches, I realised that sooner or later I should make a pilgrimage to visit them all. And so, taking advantage of some fleeting spells of sunlight and clear skies in recent days, I set out to the west, the south and to the east from Spitalfields to photograph these curious edifices. 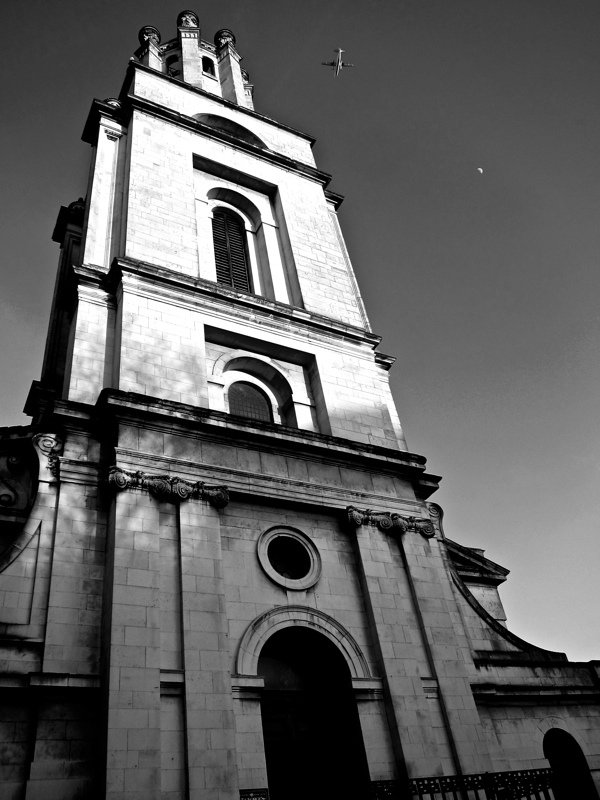 In 1710, the roof of the ancient church of St Alfege in Greenwich collapsed and the parishioners petitioned the Commission to rebuild it and Hawksmoor took this on as the first of his London churches. 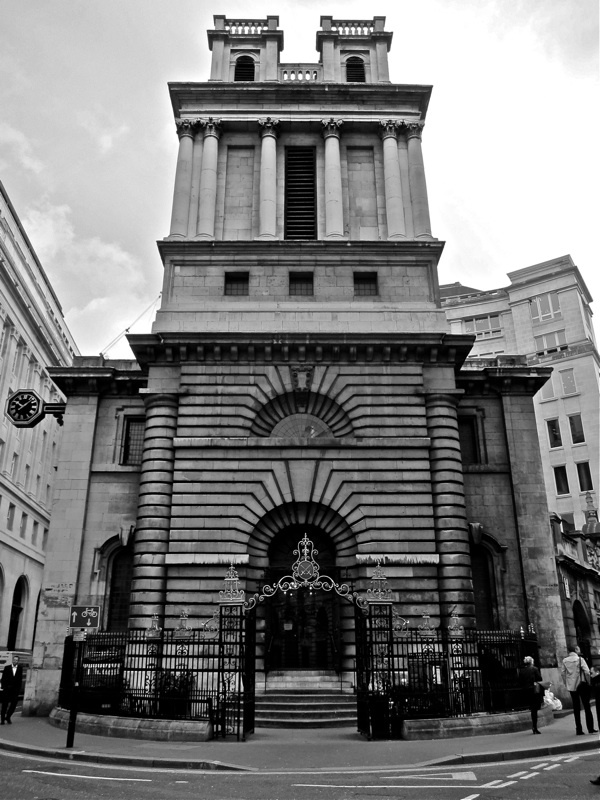 Exceeding any repair, he remodelled the building entirely, although his design was “improved” and the pilasters added to the exterior by fellow architect Thomas Archer, compromising the clean geometric lines that characterise Hawksmoor’s other churches. His vision was further undermined when the Commission refused to fund replacing the medieval tower with an octagonal lantern as he wished, so he retained the motif, employing it at St George-in-the-East a few years later. Latterly, the tower of St Alfege was refaced and reworked by Hawksmoor’s collaborator John James in 1730. Yet in spite of the different hands at work, the structure presents a satisfyingly harmonious continuity of design today, even if the signature of Hawksmoor is less visible than in his other churches. 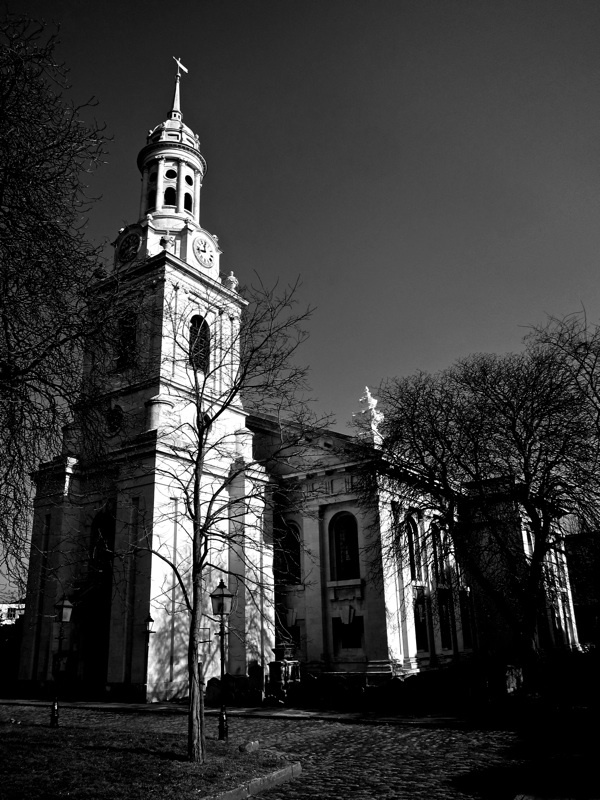 Before Hawksmoor’s involvement with St Alfege was complete in 1716, he had already begun designs for St George-in-the-East, St Anne’s Limehouse and Christ Church Spitalfields. In each case, he was constructing new churches without any limitation of pre-existing structures or the meddling hands of other architects. These three churches share many characteristics, of arched doorways counterpointed by arched and circular windows, and towers that ascend telescopically, in graduated steps, resolving into a spire at Christ Church, a lantern at St George-in-the-East and a square tower at St Anne’s. This is an energetic forceful mode of architecture, expressed in bold geometric shapes that could easily become overbearing if the different elements of the design were not balanced within the structure, but the success of these churches is that they are always proportionate to themselves. 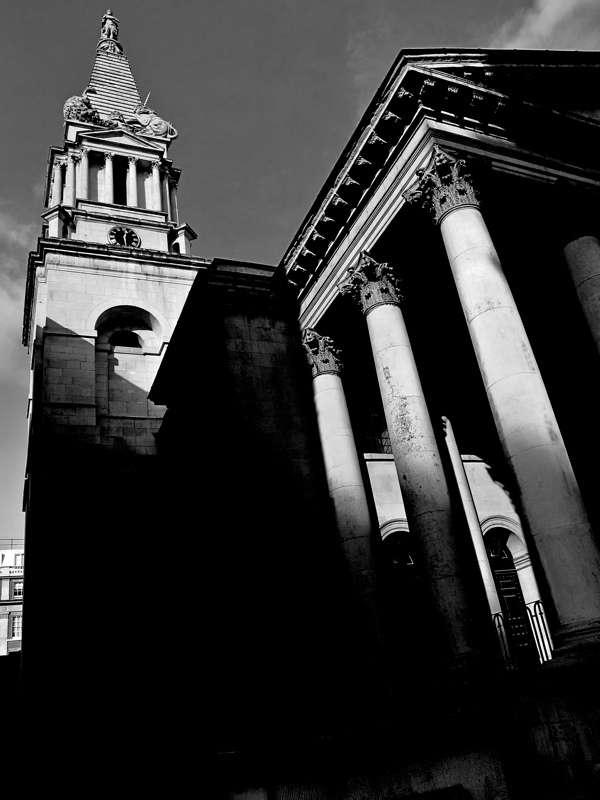 While the outcome of Hawksmoor’s architecture is that they are awe-inspiring buildings to approach, cutting anyone down to size, conversely they grant an increased sense of power to those stepping from the door. These are churches designed to make you feel small when you go in and big when you come out. In 1716, Hawksmoor began work on what were to be the last two of his solo designs for churches, St Mary Woolnoth and St George’s, Bloomsbury. Moving beyond the vocabulary of his three East End churches, he took both of these designs in equally ambitious but entirely different and original directions. St Mary Woolnoth in the City of London was constructed upon a restricted site and is the smallest of Hawksmoor’s churches, yet the limitation of space resulted in an intense sombre design, as if the energy of his larger buildings were compressed and it is a dynamic structure held in tense equilibrium, like a coiled spring or a bellows camera held shut. St George’s Bloomsbury was the last of Hawksmoor’s churches and his most eccentric, completed in 1731 when he was seventy as the culmination of twenty extraordinarily creative years. Working again upon a constricted site, he contrived a building with a portico based upon the Temple of Bacchus in Baalbek and a stepped tower based upon the Mausoleum at Halicarnassus which he adorned with a statue of George I upon the top, flanked by the lion and unicorn to celebrate the recent defeat of the Jacobites. Undertaken with such confidence and panache, Hawksmoor’s design is almost convincing and the enclosed location spares exposure, permitting the viewer to see only ever a portion of the building from any of the available angles. 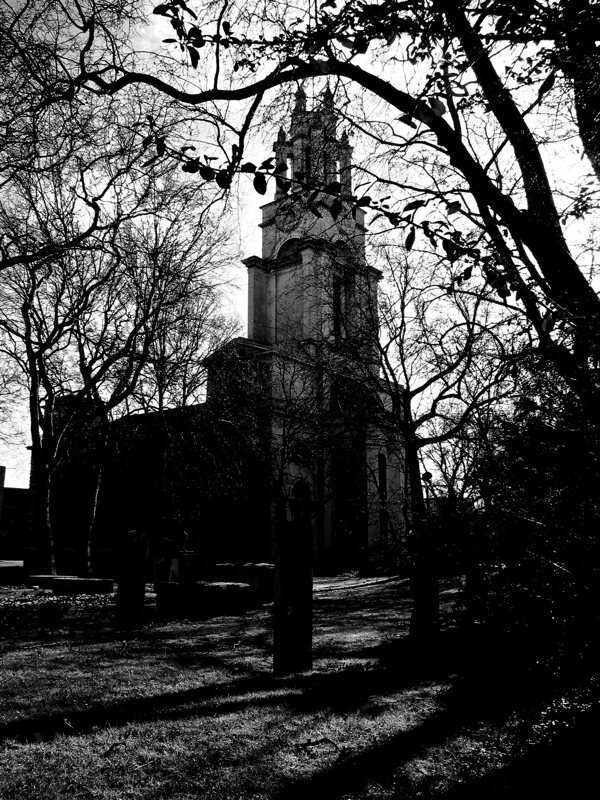 The brooding presence of Hawksmoor’s churches has inspired all manner of mythologies woven around the man and his edifices. Yet the true paradox of Hawksmoor’s work stems from the fact that while he worked in the Classical style, he could never afford the opportunity to undertake the Grand Tour and see the works of the Renaissance masters and ruins of antiquity for himself. Thus, he fashioned his own English interpretation which was an expression of a Gothic imagination working in the language of Classical architecture. It is this curious disconnection that makes his architecture so fascinating and gives it such power. 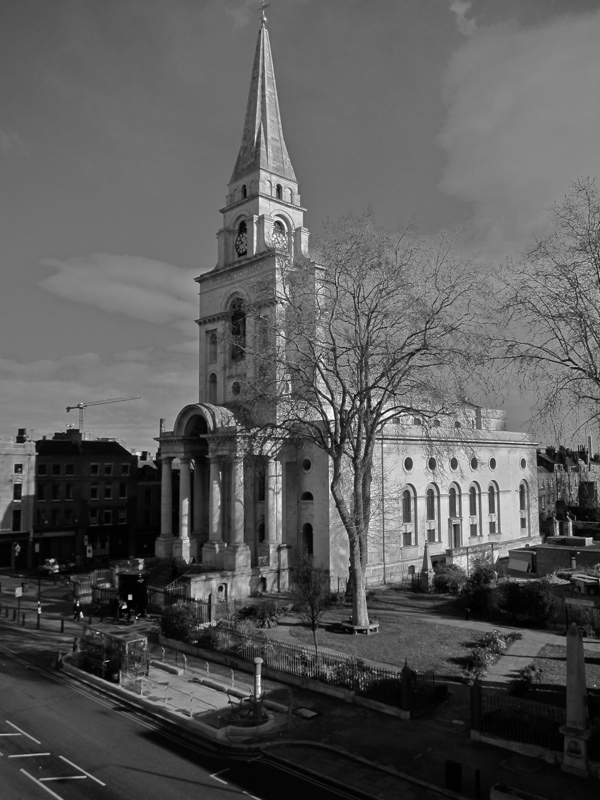 Nicholas Hawksmoor was incapable of the cool emotional restraint implicit in Classicism, he imbued it with a ferocity that was the quintessence of English Baroque. This finds direct parallels in the music of Maurice Greene-a composer who desired to enrich his music with a thorough grounding in the ‘Antients’ of Italy (by which he meant Renaissance, Mannerist and Baroque), yet with a finger on the pulse of the latest in Italian Opera (first Handel and Bononcini, later Porpora and Hasse). He never would have been able to afford to set foot in Italy or anywhere on the Continent, but became fluent enough in Italian to set poetry by Rolli. He dragged British Music, kicking and screaming, into the eighteenth century. Furthermore, his Masonic connections allowed him a freedom to communicate with his Italian colleagues where he might not have otherwise enjoyed their collaboration, as an important office holder at court. Fascinating. We have to learn to love our heritage and Hawksmoor, Greene, Pope, Burlington etc’s achievements more. Beautiful churches, beautifully photographed (and I’m strictly secular!). I visited Christ Church, Spitalfields last year because it was the church where my Holford ancestors were being baptised and married in the 18th century. It was awe-inspiring: awe-inspiring in that a building of such quality was built for poor folk. My friend’s daughter is now living in the same street as my ancestors of 240 years ago – a real coincidence as he and I live near Manchester. He came back after one visit and raved about the ‘magnificence’ of the church. And I hadn’t prompted him! It is so good to see Hawksmoor being appreciated again after such long periods of neglect. that assisted Wren, only until recently – odd. than meets the eye. I’ve certainly strong desire to visit his works maybe they’ll reveal and tell us more- umm? Think one would actually need a lucky eye though in this case. Dan Brown – help..